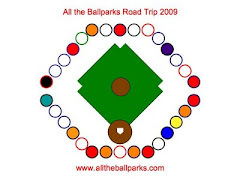 On July 10, 2009, before going to the Orioles game one of the museums we visited was the Babe Ruth Birthplace and Museum. The Museum is easy to find just by following the baseballs painted on the sidewalk from the Babe Ruth statue in front of Eutaw Street to across the street from the museum. Thus parking at the Orioles Park at Camden Yards is a good place to park to see the museum if you are also going to a game that day, especially since it did not seem to have any parking next to it other than maybe a little bit of street parking. We got to the Babe Ruth Birthplace and Museum and discovered that it is not accessible. There is not even an accessible way into the museum. However, there are only a few big steps up into it. Dad and I just lifted Mik up into the museum. The museum does have a second floor, which was impossible for Mik to get to, but at least he was able to experience most of the museum. They even let him in free since he could not experience the whole museum and we had to lift him up the steps to get him to even the first floor. Note when you buy admission they ask if you want to donate $1 to the future remodel of the museum and that remodel is to make the museum accessible. We donated a $1 and encourage all other visitors to do so in order for Mik and other physically disable people can enjoy the whole museum, especially since some cannot even enjoy the amount Mik was able to. The bulk of the museum is on the first floor. This includes a re-creation of the house Babe Ruth grew up in that originally stood where the recreation now sits. In the re-creation they also have a small display about the bars his father owned, which included some items from the bar he owned that once stood where Orioles Park at Camden Yards is now. The items were found when they were excavating to build the Orioles Park. One of the most interesting things at the museum is the wall of plaques commemorating all the home runs Babe Ruth hit. There is a small plaque for each home run. It is kind of like the giant wall of balls at the Cincinnati Reds Hall of Fame commemorating Pete Rose’s hits. Of course, the 714 home run display is quite a bit smaller than the 4,256 hits display, but still impressive even though it is not the record anymore. Other exhibits on the first floor include one on other ballplayers that have hit over 500 career home runs and a room that chronicles Babe Ruth’s professional baseball career. In the room about his career they have memorabilia such as Babe Ruth uniforms, Babe Ruth bats, and balls signed by Babe Ruth. The second floor of the museum does not have much, so Mik did not really miss the big stuff at least. The main thing on the second floor is the recreation of the second floor of the house Babe Ruth grew up in. The main display on the second floor includes artifacts related to him playing at St. Mary’s school. Overall the Babe Ruth Birthplace and Museum was worth stopping at even though it is not exactly accessible. It does a good job of showing the career of Babe Ruth, as well as recreating the house he grew up in, which actually stood where the recreation is.